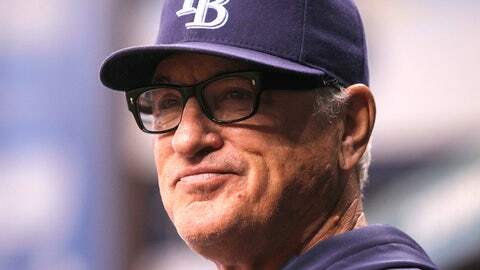 Tampa Bay Rays manager Joe Maddon hosted his eighth annual Thanksmas from Dec. 16-18. Since beginning the tradition, Maddon has served approximately 7,000 underprivileged individuals. In eight years of Thanksmas, Joe Maddon has come to learn the 10-day goodwill tour means many things throughout a region he calls home. The most important lesson the Tampa Bay Rays manager has discovered is that the greatest gift in a season of giving is hope. He offered inspiration last Tuesday evening, standing in the cafeteria at the St. Petersburg Salvation Army on the second day of his group serving an Italian/Polish meal for needy citizens of the area. Maddon positioned himself at the center of the room, wearing a dark apron that read, "Joe Maddon’s Thanksmas," and shared a message from the soul before about 225 dinners were served. This was a common sight. Maddon makes a point to address attendees before plates loaded with salad, sausage, spaghetti and meatballs with red sauce, pierogies, Italian bread and slices of yellow and chocolate cake leave the kitchen. This is a labor of love, an idea born about 11 years ago from seeing people push their lives in shopping carts during his bicycle rides from Sunset Beach to Newport Beach along the southern California coastline. On this night, Maddon began speaking after a pre-meal prayer and applause. Some at the tables snapped photos with their flip phones. He looked toward the men and women nearby, friends alongside strangers, and addressed them as if they had known one another for years. "This is a little bit of Italian and a little bit of Polish," he said to the group. "I’m half-Italian and half-Polish from Pennsylvania. I had this concept a couple years ago, Thanksmas. I used to live in California and ride my bicycle up and down the Pacific Coast Highway, and I’d see a lot of people down there in need, and that bothered me. So I thought, one day when I’d get a chance to become a major-league manager, that I would do something just like this." Maddon has seen his Thanksmas tradition grow. But recognition for a matured vision is far from the reason why he made stops to shelters in St. Petersburg, Clearwater, Bradenton, Tampa and Hazleton, Pa., his hometown, last week. To him, the meaning of Thanksmas is two-fold. On a personal level, it’s about sharing, about giving back in a life that has been blessed within baseball, including eight seasons with the Rays/Devil Rays. On a public level, it’s about raising awareness, about raising urgency, so others will be inspired to become involved. "I think every time we do it, it’s more of a blessing for us," said Tom Foley, the Rays’ third-base coach and Thanksmas volunteer. "This is just a reminder that there are folks in need all the time," said Jamie Patterson, the Rays’ manager of community relations and a Thanksmas volunteer. This reminder is more than a holiday-season photo opportunity, more than a manager and members of a franchise coming together for a moment of community service, before the offseason carries on and spring training nears. Rather, this is a time when a public figure uses his platform to walk the walk of service, regardless of the attention that comes with it. Truth be told, it feels strange scribbling notes and snapping photos when Maddon interacts with attendees as they eat. It’s as if a private bond is violated, one that’s only meant for the giver and receiver in their brief time together. It’s easy to see how Maddon’s Thanksmas enriches both the giver and receivers, with the gratitude renewed each time the manager walks over to a table of attendees. Most times, Maddon and the recipients enter the day never having met. But he treats each man or woman, boy or girl no different than members of his clubhouse. "Got it?" Maddon said, after he posed for a picture with a woman at the St. Petersburg Salvation Army. "There you go, dear." Numbers only tell part of the Thanksmas story. Maddon and members of the Rays helped raise about $20,000 at a fundraiser Dec. 13 in South Tampa, and before this year, about 6,000 people were served in previous Thanksmas events. Maddon, as he does each year, shopped for ingredients before cooking the food Dec. 15 at Tropicana Field. About 1,000 people were fed over five stops in the Tampa Bay region from Dec. 16-18. "I think we’re building a tradition right now, I do," Maddon said. "We’ve been building it, we’ve been building it. It has been nice coming back to see a lot of the same faces." Many times, the public only sees one side of celebrity. Fans have a limited view of who their favorite players, coaches and managers are as people. Perceptions are formed through what’s observed during games and heard through small sound bites in interviews. Rarely is the veil lifted, especially for society’s greater good. When watching Maddon during Thanksmas, the manager persona fades away, and it’s easy to notice how this event is close to his mind and heart. "Is Santa going to pop out of these boxes, Joe Maddon?" one young boy asks, when two cardboard boxes filled with wrapped presents are carried near at Christmas tree at the Sallie House in St. Petersburg, a safe haven for kids, infant to 11 years old, who have been removed from homes because of abuse, neglect or abandonment. Such moments are what Maddon had envisioned all along, when he observed a darker side of the opportunity divide on those rides along his picturesque path in California. He wants struggling people, regardless of age or gender, to know they’re seen, that they’re not invisible, that they don’t fade into the blur of everyday life that too often excess dulls. That’s why he approached the then-Devil Rays about creating Thanksmas after making the transition from Los Angeles Angels bench coach to Tampa Bay manager before the 2006 season. He saw a need. He acted. "Joe has a passion for those who are sometimes invisible, who have fallen through the cracks," said Major Tim Gilliam, commander for the St. Petersburg-area Salvation Army. "I think what we’ve learned from Joe is that it takes a community of people who care forever, especially this time of year." At each Thanksmas stop, for a few moments, it’s easy to be humbled by the thin line between prosperity and need. To many, the visit by Maddon and his volunteers is an anticipated event that means an escape to normalcy, if only for a few hours. Little, other than stable jobs and opportunity, separates them from those who fill workplaces throughout the area, from those who labor to support families and make loved ones proud. Like everyone, those who attend Thanksmas carry hopes, goals, dreams of a better tomorrow. "I believe in showing love to everyone," said Theodore, 49, who attended Thanksmas at the St. Petersburg Salvation Army. "There are times I’ve given (shoes) off my feet to someone, leather jackets off my back. I barely have much to go on myself. There’s a lot of love within these people. There are a lot of different hurts. A lot of people are going through a lot of different emotions." "If someone had said to me a year ago that I would be sitting here at the Salvation Army, I probably would have laughed until I fell out of the chair," said Lynn, 57, who attended Thanksmas at the Tampa Salvation Army. "I didn’t realize back then that the only difference between me and the people I saw in the street was sometimes only one paycheck, or a couple of paychecks. So I’ve had a very big lesson in what really is important to be thankful for." The Thanksmas mission is revealed in small moments. It’s found in women posing for pictures with Maddon near the kitchen. It’s found in firm handshakes and baseball talk at the tables. It’s found in gifts given to each attendee — shoes for kids, scarves for adults — and warm words that deliver hope. "Do you guys like cake?" Maddon told the kids at the Sallie House before dinner. "We brought some cake. How about Christmas presents? "Enjoy everything. Happy Thanksmas. Everybody is loved here, so understand that." Maddon has seen Thanksmas develop from an idea to a tradition, but he sees the mission as a work-in-progress. As with most visions, the evolution is never complete, tweaks here and there always to be made. He wants to see the spirit spread to create more volunteers who present a message of hope. "How do we get more people to volunteer? That’s the next step," he said. "We’re talking about ways to do that right now. Hopefully by next year at this time, those vehicles will be in place." It’s interesting to consider how far Thanksmas can go. Everyone involved with the event, from Maddon to the support staff, knows these 10 days only extend so far. There are 355 others throughout a year where a need is present. There are 355 others to touch lives, to use influence for good beyond nine innings and a box score. "I don’t know that many of us are too many steps away from being in this situation," said Karen Heinemann, director of development for the Salvation Army in Hillsborough County. That’s what makes Thanksmas so important, from the food to the company to the memories made. This event means many things, depending on perspective, depending on which side of the opportunity divide a viewer resides. This event is an example that awareness — and empathy to help others — can go a long way. "Whenever I had a chance to make a difference," Maddon said, "I wanted to do that." It’s a little bit Italian, a little bit Polish, with a whole lot of love involved.